11/1/2015 was Koodarai vellumseer day and at Tirukundanthai Andavan Tirumamani Mandapam Ubha.Ve. Adoor Asuri Madhavachariar swami explained Maale Manivanna the previous pasuram before moving to the 27th pasuram of Tiruppavai and the 6th pasuram of Tirumangaiazhwar’s Tirunedunthandakam.We should not seek small favours from Perumal when He can give us Purushaartham. Doing saranagathi and realizing every moment that He executes every action is the need. We live in the delusion that we are the doers. Realising that we are incapable of doing anything independently and having Mahavishwasam(total faith) that He will protect us is the requirement. This mahavishvasam should be there before, during and after prappathi .Nammazhwar kept asking for moksham but Perumal kept delaying because He desired to hear 1000 verses of Tiruvaymozhi. Perumal is waiting for us to come to Him but we do not take even the first step. Andal and Her goshti have come to Krishna seeking kainkaryam. They address Him as Vatapatrasayee (The One lying down on the peepul leaf) When Mahapralayam happens Perumal lies on a peepul leaf and shows He is Sarvaswami. It is to this Krishna that Andal prays in” Maale Manivanna”. Andal asks for Panchajanyam Krishna says He will give Her three conches-!) The conch Panchajanyam which He blew at the start of Mahabharatha war .On hearing it Dhritharashtra and the Kauravas were scared as they knew their end was imminent. For Pandavas it was the sound of victory.2) The second conch was the conch Krishna used to blow to round up all the cows of Vrindavan before driving them home. 3)The third conch was used during Rukmini Haranam. Rukmini had sent Her sandesham (message) through a brahmana and had done saranagathi to Krishna.While waiting for Him to come the smell of Tulasi comes wafting in the air and She realizes that Krishna is near-by, soon the sound of His conch is heard making Her relieved. All three conches are for Andal. Parai is a drum like instrument beaten to make announcements. In Krutha yugam when Vamana got back the kingdoms lost by the devas from Mahabali the victory drum was beated by Jambhavan calling the gods to take back their dwelling places. The parai was played when Krishna did the Navaneetha Natyam(” Butter Dance.”) Pallandu singers are the Azhwars who are all Andal’s gurus. Kola villaku is Adhi Seshan who is like a deepam. Flag and Vidhaanam is Garuda. Krishna asks Andal if She wants to take all these and defeat Him. No says Andal we want no victory over You ,we want to join You. 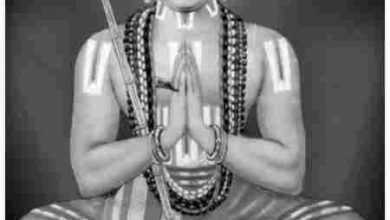 Even if one realizes Perumal they refuse to fall at His Feet. Ravana after fighting with Rama says that He could only be Narayana yet he says even if cut into two piece he will not bend down befor Rama. 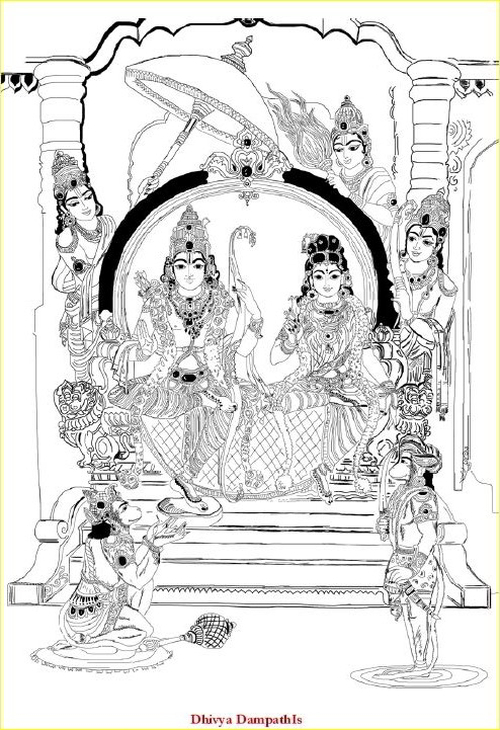 Such a person Rama won over by Shauryam (valour). 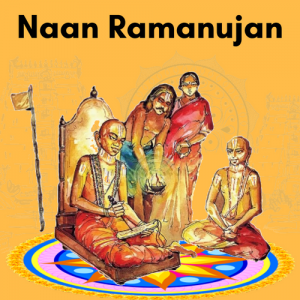 Rama never revealed His Paratvam and lived an ideal man’s life. How then did You send Jatayu to moksham asks Bhattar?SriRama was Satyam( Truth) Personified so He could doit. If we take 4 steps He will take 10 steps to meet us. Andal is named as the nachiyar who came to sing. They ask for vastrams (clothes) worn by Him as also ear ornaments, shoulder ornaments etc. After dressing up they want to offer Ksheerannaam( rice cooked in milk overflowing with ghee) and share the prasadam with everyone. 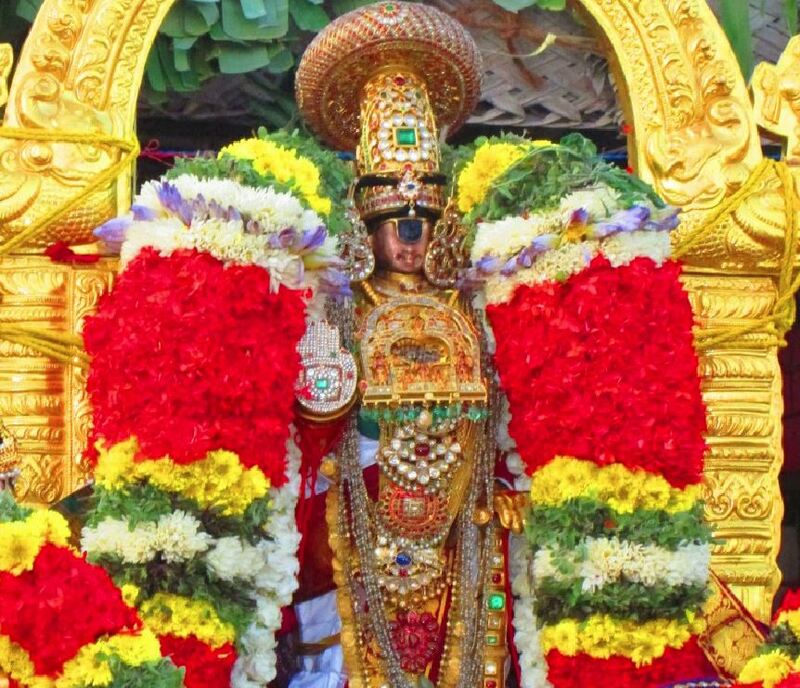 Perumal is Ksheerannam. We are what we eat. Rajasic foods induce anger and haste, Tamasic food induce lethargy and indecisiveness. Satvik foods induce goodness and balance .Aharam is the base for gunams. Tholvalai refers to the shanku, chakram acharyas wear and put on the shoulders of shishyas.Thodu (earrings) and sevipoo(ear ornament) refers to the secret imparting of mantrams by acharyan and vidhaanam refers to satvika thyagham (offering the outcome of an action at the Feet of God).The goal is continuous kainkaryam at His Feet. Swami then took up the 6th Pasuram of Tirunedunthandakam. 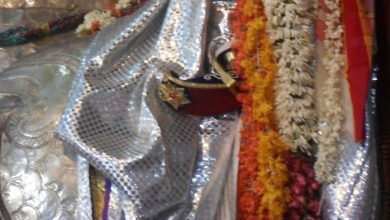 Tirumangaiazhwar asks his mind to accompany him to Tirukovilur. Tirukovilur is purified by the meeting of the Mudhal Azhwars Poigai, Bhutham and Pey . There was space in the alley for one to sleep, two to sit and three to stand but two more joined them that is ,The Divya dampathi.Sighting them each azhwar poured His experience resulting in the 1st second and 3rd Tiruvanthathis. Vamana’s small feet represent the short Ashtakshara manthra which though small is powerful. Tirumangaiazhwar goes on talk about the Audharyam(generosity) of Perumal who gives so much that the receiver says Yatheshtam( enough enough) yet He feels enough has not been given. 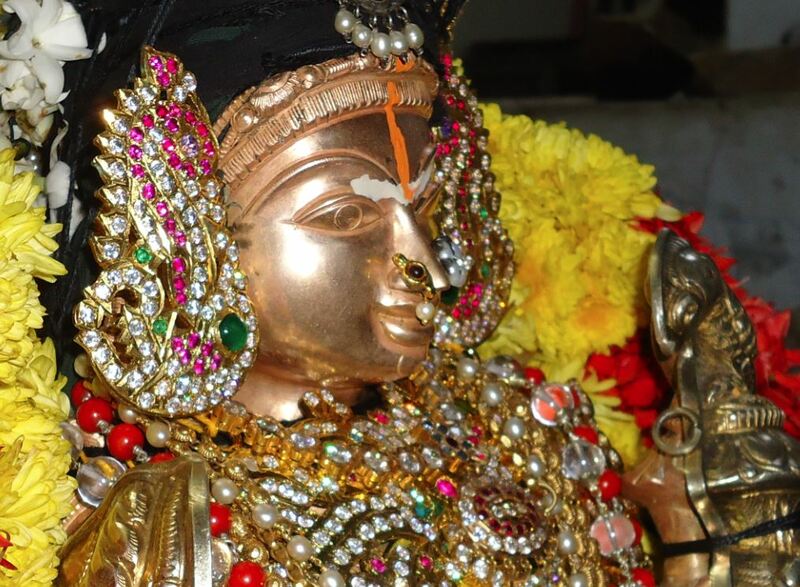 But His devotees do not crave for material wealth .Tirukovalur is filled with plenty. The fields are green and fertile and the harbour is filled with rare pearls but the bhakthas of Tirukovalur do not care for them. Their wealth is Trivikrama and they desire only Him.We too should not run after money and gold and gems but associate with those who long for Perumal. Perumal will always have the Hitham(good) of a saranagathan and will give him whatever is for his good. He does not have to ask at all. But for vairaghis(desireless) He does not give as they are not interested. 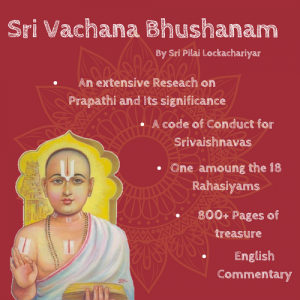 Do Dwayanusandham and do kalakshepam of its meaning. Live in a divyadesams and contribute for prasadams, clean up temples, offer ghee/oil for lamps etc. and finally if all these are not possible live among Srivaishnavas. Thus Tirumangaiazhwar asks the mind which is called the 11th indiriya (senses) to go with him to Tirukovalur ruled by Trivikrama.